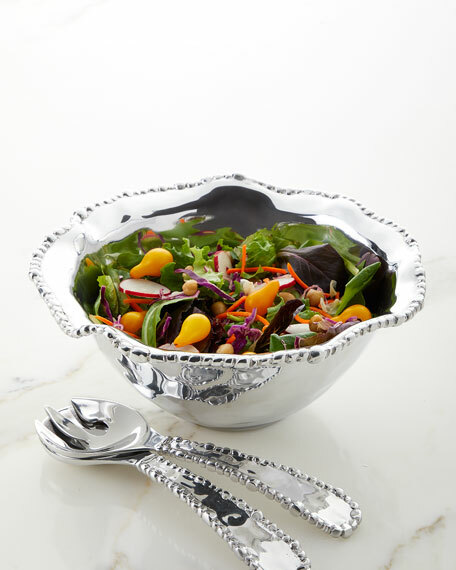 The Beatriz Ball Organic Pearl Nova Flirty Medium Bowl works well with other Organic Pearl bowls and platters, and blends easily with more traditional styles. Distinguished by flirty curves, the bowl is a must-have size and shape for entertaining. Great for salads, sides, snacks, and more. Makes a unique gift for anyone on your list. Each piece is created by hand, one at a time, by skilled artisans using the ancient technique of sand casting. More than twelve pairs of hands are involved in the creation of each piece. Of heirloom quality, Beatriz Ball metalware will not tarnish or lose its shine. It can be used with confidence to heat, chill and safely serve food. Easy care, never tarnish. Chill or warm foods up to 350 degrees. Okay for acidic foods. To prevent stains, do not store food or leave in standing water for long periods of time. No dishwasher. As with any metal, do not cut on surface. For in-store inquiries, use sku #2414081.